Dwayne Haskins has drawn a lot of interesting pro comparisons in advance of NFL Draft Day. 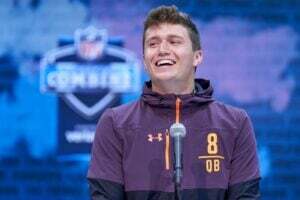 We have seen the likes of Kirk Cousins, Drew Bledsoe, and Jared Goff mentioned when some analysts talk about Haskins. There have even been some bold statements, such as Trent Dilfer comparing Haskins to Tom Brady, Yeah, Dilfer has already drawn some snickers and chuckles for that one, but what if he ends up having the last laugh? Haskins’ appeal slipping before the NFL Draft? For much of the time leading up to this month’s NFL Draft, Haskins was widely heralded as one of the top two passers from this year’s rookie class. Some even had him as their clear top QB in the NFL Draft. But then the rumor mills pushed Kyler Murray to the top of the board, as Kliff Kinsgbury is now expected to make him the No. 1 overall pick. Meanwhile, Peter King recently reported that Haskins’ stock was dropping to the point where he may be the fourth QB taken, behind Drew Lock and Daniel Jones. You have to take anything that King says very seriously, as he is maybe the most well-connected of all the NFL Insiders we regularly follow. He certainly is the most well established. Haskins is more of a classic pocket passer, not one of the “newer style” dual threats such as Murray and Russell Wilson. He throws a terrific deep ball, is very good at reading defenses, and has a great arm. He has been hailed by some as the best pocket passer among this year’s rookies. He has the ideal size and arm strength for teams looking for that type of QB. But Haskins also has limited mobility and must improve his footwork. Anticipation, touch passing, and decision making have been identified as areas he has to improve on. He also does not have a lot of starting experience at the college level when compared to some other prospects. Those could be among the reasons why some of his shine has worn off. Originally, many mock drafts had the New York Giants taking Haskins with the first of their two first-round picks at No. 6 overall. Yet some recent reports have indicated the Giants may not take a QB at all in the first round, or the team might even trade for a Josh Rosen, or if you believe the hype, Wilson. The one item that has me thinking New York will not enter 2019 without a new starting QB is their acquisition of Golden Tate. He is the ideal safety receiver for a rookie passer or a young guy like Rosen. A recent view of four NFL Draft mocks on NFL.com already had Haskins off the Giants radar, with only one analyst believing that New York will take a QB, and it was Lock. Going to the Giants would mean Haskins has a quality supporting cast around him in terms of playmakers, but the offensive line was ranked 25th by Pro Football Focus last year. While the team is still working on improving the unit, it would not seem to be the ideal destination for him in terms of pass protection. The next team to have a legitimate interest in Haskins could be the Broncos at No. 10., and the same NFL.com analyst who had Lock going at sixth, Peter Schrager, projects the Broncos to take Haskins. I believe that would be a great fit for Haskins in terms of his longer range outlook. He could possibly play behind Joe Flacco for a bit, and he would be learning the finer points of the game from a Super Bowl winning QB. Haskins already has been mentored by former CB Shawn Springs and Falcons WR Mohamed Sanu. Such a scenario would drop his stock in rookie dynasty drafts, though, as he may be projected to be a second-stringer for much of his rookie season. But if Flacco struggles to move the offense, Haskins could get his call to start at any time, so don’t believe that he will be fully locked into a backup spot in Denver. He also has a crew of very promising young WRs there who could become his BFFs for a long time, plus a trusted veteran in Emmanuel Sanders. There also has been some conjecture that Haskins could go to the Bengals at No. 11, as new coach Zac Taylor may look to put his own unique stamp on the offense. The team has not committed to extending Andy Dalton and the drafting of Haskins could signal they will not do it at all. Then it will just become a matter of time before Hoskins starts with a fine supporting cast of playmakers around him and a lot of upside to look forward to, especially if the 27th-ranked offensive line improves. Cincinnati would be a very appealing spot for Haskins, but the team could simply elect to take an offensive lineman instead. For shorter and longer-term fantasy purposes, though, I would like to see Haskins in Cincinnati. From a pure needs perspective, if Haskins is still there for the Miami Dolphins at 13, it would be hard to envision them not taking him unless one of the other top QBs has slipped as well. But Haskins would be entering a really bad situation fantasy wise. The receiving crew is thin and the offensive line was terrible last year. Things are not looking up much at all in 2019, as the team is starting to resemble the Marlins in helmets. The Dolphins situation is a major rebuild, and I would be worried about Haskins being overcome by adversity early in his career. The situation would not be a whole lot better if he went to Washington at No. 15, although playing in Jay Gruden’s West Coast offense would be a pretty good fit. Much like in Miami, the receiving crew is very shaky, although a bit better than what the Dolphins have now. If Haskins falls further than 15th, the Giants could still be in play at No. 17, and you would also have to wonder about the Raiders at No. 24. 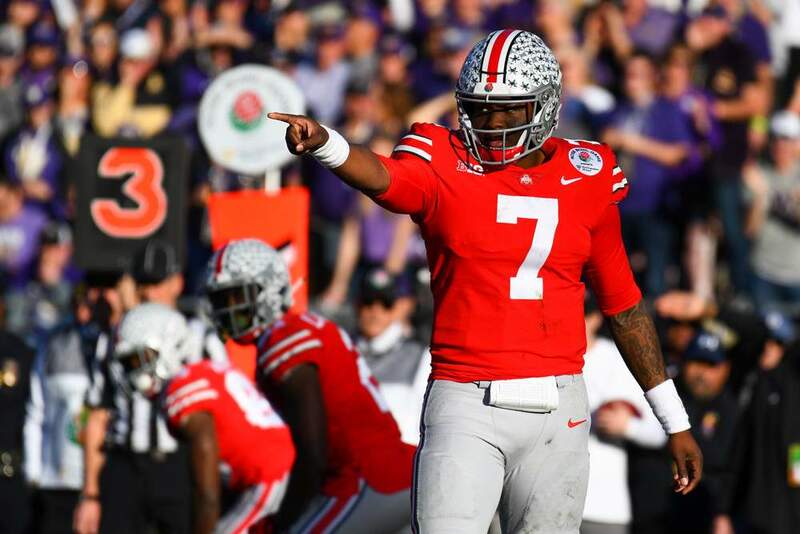 Would Oakland even entertain the thought of tabbing Haskins earlier? They do have the fourth overall selection as well. Published reports have indicated the Raiders are very intrigued by Haskins. A combo of Haskins/Antonio Brown would seem very fantasy friendly given Haskins’ arm strength and Brown’s amazing skills. After the Raiders at 24th, the Chargers and Patriots could take Haskins as their QB of the future, but such scenarios would obviously hurt his fantasy stock in the early stages of his career. Haskins will look like he had a good reason not to show up in Nashville and endure the blazing heat of a negative spotlight if he is taken in the 20s or later. Ultimately, going to Denver or Cincinnati could mean Haskins has a chance to start with some quality playmakers around him early in his career. Oakland could be promising as well. Are the Giants really out of the mix? No one knows for sure, because this is known as “lying season,” the period before the NFL Draft where falsehoods are spread as NFL executives and coaches try to mask their true intentions. So we can only have fun speculating until then, and our rookie mocks will have to wait until the NFL Draft is done. There is no sense in doing a fantasy mock of a rookie draft!